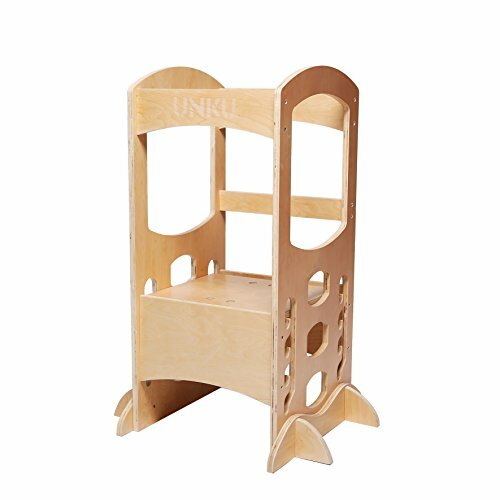 kitchen step stool for your lovely little helper use. Keeps your kids close and safeguards them. A good gift for parents that want to spend time in the kitchen while keeping the child engaged and safe. Suitable for parents promotes self-independence and the children willing to help with your chores at home. LITTLE KITCHEN HELPER'S STEP STOOL: Elevate your toddlers to the counter height so they could wash and clean the utensils themselves as they watch and learn how you cook. One of the essentials during your children's independence education. SAFETY CONSCIOUS AND ENVIRINMENT FRIENDLY: Extra large size and added safey rails guards your child from falling while playing. Smooth curved edges and the quality material, safe and nontoxic. PACKAGE & ASSEMBLY: All the parts are carefully wrapped and packed with assembly tools & detailed assembly manual provided. Better borrow a pair of extra hands to hold the objects during the assembly. Takes about 15-20 minutes of work in the experienced DIY hands. EXCELLENT CUSTOMER SERVICE: Do contact us if any questions or problems arise, our customer service team 24/7 standing by. Free return & replacement within 14 days after the purchase.